Galatians is probably one of the more strongly-worded Pauline epistles in the Bible. Indeed, Paul uses very emotional language in various points throughout the book. The churches of Galatia were planted by Paul and Barnabas as detailed in Acts, and Paul also visited them with Silas in Acts 16. Before long, however, false teachers of the ‘gospel’ entered the Galatian churches and began preaching a different gospel from that which Paul preached, causing the people of Galatia to be confused. These false teachers taught that even the Gentile Christian converts had to follow the Law of Moses – largely the dietary laws and circumcision – a teaching which infuriated Paul. The purpose of his letter was then to emphasize that there is only one Gospel – the one which he had preached, and he backs up his own apostleship which has been used as a factor by the false teachers to discredit Paul and his teachings. 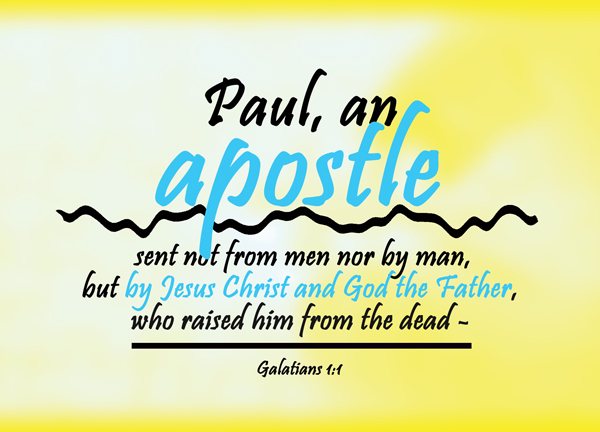 In the first verse of the book alone, we see how Paul’s unique apostleship was described. While Galatians is very rich in theology, for today’s study let us simply focus on Paul the apostle and what a man he was. Paul – Seriously, who is Paul to write to the Galatians in this way? As mentioned in the brief, this letter was quite harsh and Paul basically scolds the Galatians for being stupid [Gal 3:1] for being swayed by false teachers who should be eternally condemned [Gal 1:8-9]. But who is he, that he should insist that the gospel he preaches, not theirs, is the right one, and the only one? I like that in the Bible, there is always a dramatic emphasis on names. Paul the Apostle was Saul of Tarsus, but these are two vastly different identities – Saul was the persecuter of the Church and of Christians, and he was the one who oversaw the killing of the first Christian Martyr, Stephen. It’s actually the same name, Saul and Paul – there was no real name change, but the name Saul is Hebrew. As a devout Jewish, an austere Pharisee, he would have be known as Saul. However, after Damascus, and having taken it upon himself to spread the gospel to the Gentiles (indeed, today we recognise Paul as the Apostle to the Gentiles), he adopted the Greek rendition of his name, and he began known in the Bible, from then on, as Paul. an apostle – apostle means a man who has been sent with immediate authority – indeed, its root word, in Greek (apostolos) means to be sent. Who are the apostles? We know them, they’re famous, they followed Christ everywhere during his ministry and were all called to follow him – the twelve disciples, often just called the Twelve. Of course, the assumption is that Matthias replaced Judas in his position, although we were never told about what Matthias did in his role as an apostle. Today the term or the title of ‘apostle’ is used a lot more freely, however in those early church days, it was largely a restricted term with restricted usage. – sent not from men nor by man, but by Jesus Christ and God the Father – this was perhaps the most unique thing about the first apostles – today people who walk the path of full time ministry may claim, and rightly so, to be sent not from men, but by the Holy Spirit, called by Christ, and submitting to the ultimate authority that is the word of God; but they were still appointed by man, like it or not. Not the apostles – it was obvious for the Twelve, they were commissioned by Christ himself, and were the ones closest to Christ during his time of ministry. Were there other apostles? Yes, even in the age of the apostles, Barnabas had been called an apostle [Acts 14:14], and a way, he was, as he was sent [Acts 11:22] to do the work of God. There were also others who were sent in those days. However, while they were indeed sent out to do the work of God in various ways, it must be noted that they were sent and commissioned by the apostles – the original apostles, who were men, not God. who raised him from the dead – Oh, this is important. This is the crux of our gospel – for if Jesus Christ had died but was not risen from the dead, this would be a dead gospel that they preach – a hopeless gospel. Indeed, this was also proclaimed by Peter on the day of the Pentecost – God has raised this Jesus to life, and we are all witnesses of it [Acts 2:32]. What the Apostles (with a capital ‘a’, the original Apostles with divine apostleship) had, was absolute authority with regards to the gospel, for the revelation they received was directly from the Lord and not from men. As Paul emphasized, nobody taught him the gospel [Gal 1:12] – he didn’t sit in class or church to learn what he knew about the gospel from any man. Likewise for the other Apostles – look at how Peter received his revelations in the house of Cornelius, which opened the way for Gentiles to receive the gospel. It was entirely supernatural. And because the Apostles had absolute authority, what they write and what they preach is the Scripture.